This entry was posted on May 24, 2012 at 6:00 PM and has received 41037 views. There are currently 6 comments. Print this entry. Awesome test. Good to see some empirical evidence of something we`ve all `suspected` to be true. Have you logged it as a bug? ]:-) Perhaps the monitor deserves a revamp in CF11. It`s been more or less the same since CF8 hasn`t it? Gary, I know there is at least one defect open for this, including one logged by me. There are probably others similar to it too. I`ll try to find the tracking numbers. 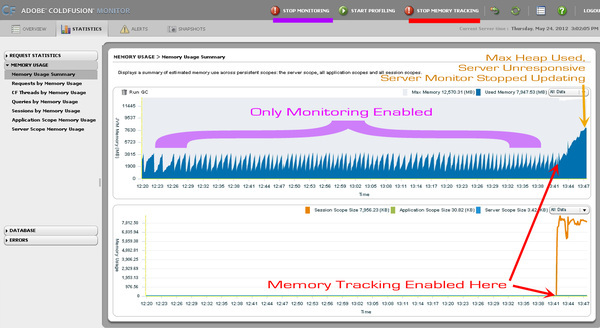 Adobe is well aware of it and reinforce that you shouldn`t enable Memory tracking in production. Try Fusion Reactor for production monitoring. Memory tracking that "shouldn`t be used in production" is rather pointless given that most problems that would benefit from memory tracking occur in production rather than in development! :-) Maybe Adobe should bite the bullet and do a deal to bundle Fusion Reactor (or a slightly limited version) with CF. Or would it be cheaper for them to overhaul their own built in monitor? Who knows. I would love to see the results of running on Tomcat 7 w Load Balancing vs JRun .... Jrun's a bit behind the times test de grossesse.